I’m honored to be joining ScriptPhD.com as an East Coast Correspondent, and look forward to bringing you coverage from events in such exciting areas as Atlanta, Baltimore, and New York City – as well as my hometown of Washington, DC. And to that end, here is a re-cap of the World Science Festival’s panel “Battlestar Galactica: Cyborgs on the Horizon.” For anyone interested in the intersection of Science and Pop Culture, I cannot promote this event enough. In addition to the panel I’ll be describing, some of the participants included Alan Alda, Glenn Close, Bobby McFerrin, YoYo Ma, and Christine Baranski from the entertainment sector. Representing science were notables like Dr. James Watson (who along with Francis Crick was the first to elucidate the helical structure of DNA), Sir Paul Nurse (Nobel Laureate and president of Rockefeller University), and E.O. Wilson (who is celebrating his 80th birthday in conjunction with the festival). Remember back during our complete coverage of the Battlestar Galactica panel at the Paley Television Festival when I said that event would probably be the last significant gathering of on and off-screen talent from the show? Well, I may have been lyingpremature in my declaration. Its no secret that in the annals of television history, Battlestar Galactica will rightfully take its place as one of the most sophisticated, abstruse, demanding, and thoughtful shows to ever grace the silver screen. No issue or hot-button topic was off-limits to the writers: war crimes, torture, genocide, abortion, religious conflict, human rights, the rule of law, anarchy, the very essence of humanness. Though an action-adventure space opera to its core, BSG integrated storylines eerily germane to the times we live in, and transcended its medium in the process. In recognition of these tremendous achievements, and in a television first, the United Nations hosted an invitation-only panel back on March 17th in the hallowed Economic and Social Council Chamber composed of UN representatives and officers, cast members Mary McDonnell and Edward James Olmos, and executive producers Ronald D. Moore and David Eick. As a pilot project for its Department of Public Informations Creative Community Outreach Initiative, the UN hopes to partner more often with the international film and television industries to raise awareness and foster discussion of prevalent global issues. Unfortunately the first United Nations event took place at their headquarters in New York and we had to miss it (sadly, the ScriptPhD is not yet bicoastal). But luckily for us, the United Nations partnered with the Sci-Fi Channel to host a West Coast rebroadcast from Hollywood Thursday night. As a part of the Los Angeles Timess annual pre-Emmy Envelope Screening Series, LA Times writer Geoff Boucher moderated a panel that once again welcomed McDonnell, Olmos, Moore and Eick, and UN representatives Steven Siguero and Craig Mokhiber. we all!s, a lively and vibrant discussion ensued about torture, enemy combatants, race, and the upcoming Battlestar Galactica: The Plan TV movie event. ScriptPhD.com is proud to bring you complete coverage. To read a transcript of the LA Times Envelope Battlestar Galactica Discussion Panel please click Continue Reading. On a recent sweltering evening in late April, the ScriptPhD ventured out to Los Angeles’s majestic ArcLight Cinema Dome, which was playing host to the tenth night of the 26th Annual William S. Paley Television Festival, a preservation and celebration of the very best the small screen has to offer. Each year, a handful of select shows are selected by the Paley Center for Media to screen an episode and engage in a question and answer session with onscreen and production talent. This year, writers, producers and actors from the recently completed epic space opera Battlestar Galactica, and its forthcoming prequel Caprica, delighted a small audience with a sneak peek at the Caprica pilot and a candid behind-the-scenes look at the creative process behind both shows. Fans in queue for the Caprica screening and BSG/Caprica Q&A at the ArcLight Cinema Dome in Los Angeles, CA. Fans at the beginning of the line had queued up as early as 11 AM to witness what may be the last gathering of BSG cast and crew for quite a while, while others paid thousands of dollars for VIP after-party access to the cast and crew. Echoing the diverse fanbase that Battlestar Galactica was able to reach and appeal to, the crowd around me was composed of all ages, races, and genders, of the geeky, the giddy and the gaudy. As a preamble to the screenings and panel discussion covered below, the heart and soul of Battlestar Galactica, producers David Eick and Ronald D. Moore (I’ll let you decide who’s who), thanked the two people responsible for the success of bringing Caprica to the attention of Sci-Fi network, writer Remi Aubuchon and director Jeffrey Reiner. They then brought an always-refreshing bit of mayhem to an otherwise dignified event by kicking off Caprica’s first major screening with a few good-luck tequila shots from a flask (ohhhh these are MY kind of people!). 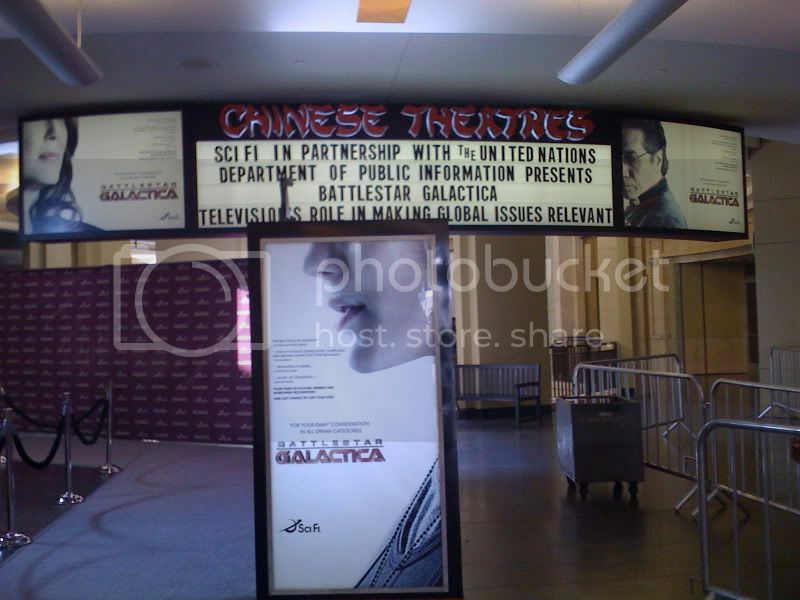 Finally, we were treated to a pre-DVD release screening of the Caprica pilot in its entirety. My pilot review may be found in a separate post. Caprica will start airing on the Sci-Fi channel in 2010. The pilot is available on DVD. Click “continue reading” to find the only full, unedited, word-for-word transcript of the BSG/Caprica panel to be found on the internet. Until the Paley Center releases the DVDs of the event next year, the only place to truly find out what happened without missing a beat? ScriptPhD.com!